Having been known as the country full of interesting facts, namely the very last Buddhism Kingdom in the world, the country of modest population of only 700.000 people, the home of the world-roof Hymalayas and the happiest country in the world, Bhutan is also bestowed with its own unique cuisine that every visitor cannot stand giving it a try. 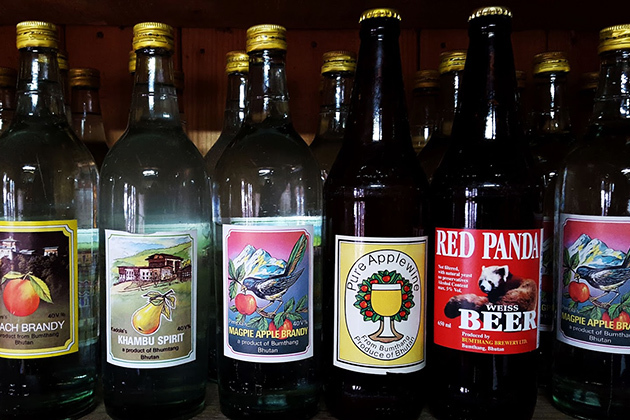 Bordering with China, India and Tibet, the Bhutanese’s cuisine has a lot in common with these neighboring lands; however, it still holds its own distinctive feature: it’s less oily than Chinese and Indian dishes, and much spicier than most Tibetan food. Once visiting Bhutan, you have to prepare yourself to try burning dishes since one of the main ingredients – often considered as a kind of vegetable by local people – in every Bhutanese meal is chilies. Be ready to set your mouth on fire with 5 must-try dishes when setting foot on Bhutan’s land! Ema datshi is properly one of the most famous dishes of the “Thunder Dragon” land and is constantly on the top list of must-try dishes of visitors coming to Bhutan. Ema datshi consists of two main ingredients: fresh chilies (Ema) and farmhouse cheese (datshi) and is considered as the national dish of indigenous people. 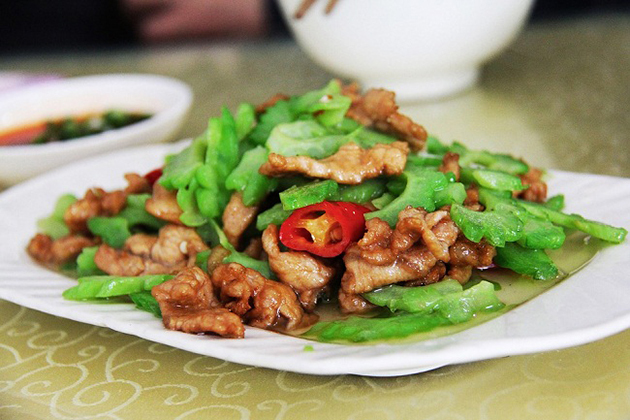 The recipes for this traditionally national dish very slightly to suit each individual taste: mushrooms, green beans, ferns, and potatoes can be served with, or different kinds of fresh or dried chilies like green or red ones can be substituted for. Just like traditional “pho” of Vietnamese people, Ema datshi is also the national pride of Bhutanese people. 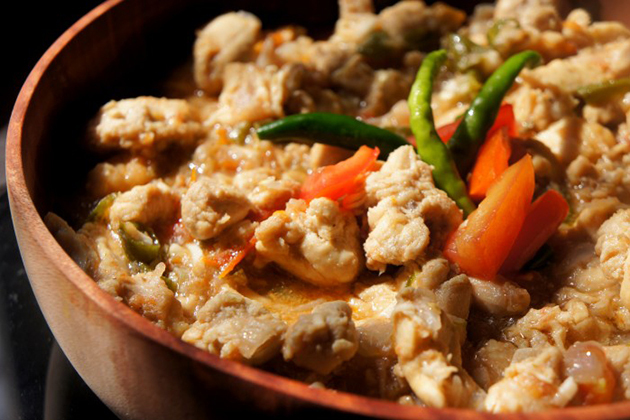 Jasha maru is a kind of stewed minced chicken only found in Bhutan. It is often cooked with chicken stock, different herbs, and chilies. What makes it a distinctive dish is the red chilies that people use to cook are grown only in Thimphu region and this kind of chilies is regarded as the featured ingredient of Bhutanese cuisine. Jasha maru is often served with rice. Being an Asian country and greatly influenced by two neighboring countries which are China and India, Bhutan still preserves the culture of rice grains. Unlike any other countries, the rice grains in Bhutan have a very special color – dark red one. Red rice has been keeping as the soul of each meal of Bhutanese people and foreigners may find red rice in either daily meal or festive occasions. Red rice is grown almost in Paro valley where crops are irrigated by mineral-rich water. Thanks to the fertile lands there, red rice enjoys very high nutrient value and brings about very earthy taste to the diners. With only one serving of Bhutanese red rice, you can get roughly 80% of your daily need for manganese and 20 % for phosphorus’s need. 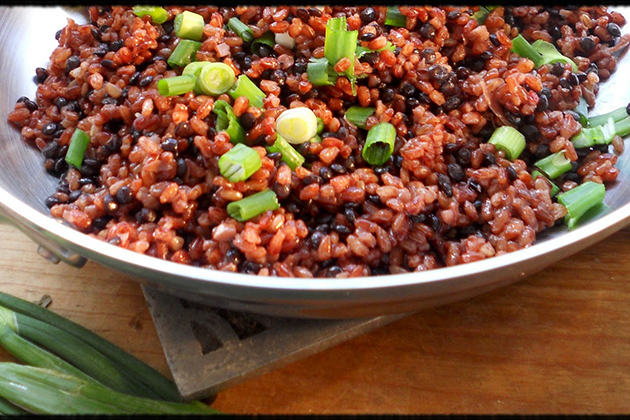 Before being cooked, red rice has dark red color, but the color turns into a paler one after being cooked, and the texture becomes soft and sticky. 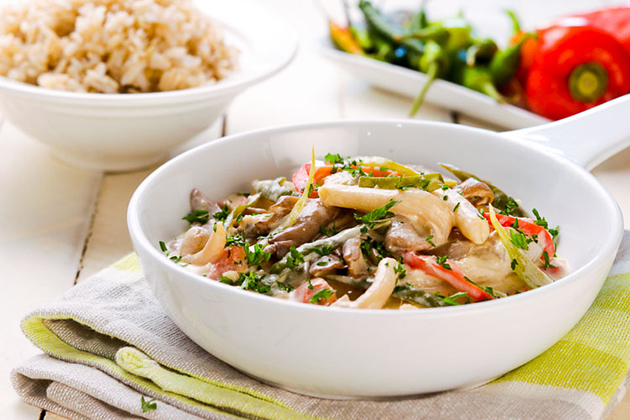 This earthy delicacy is often served with meat or other salty food in an Asian style. 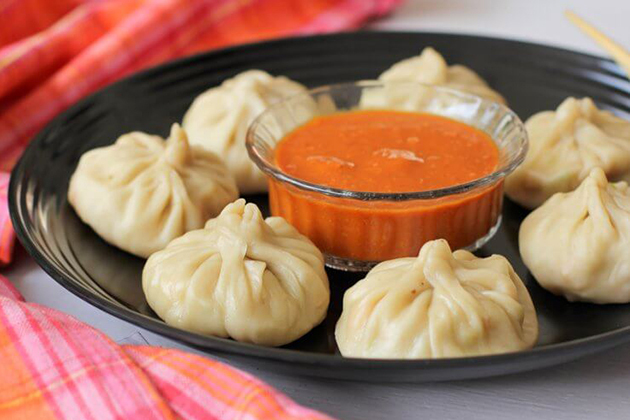 Western travelers may find momo a very distinctive dish that shouldn’t be ignored since that delicacy is immigrated to India and looks similar to dumplings in China. Throughout the Himalayas, from Nepal and Tibet to Bhutan, these steamed rolls are served as local treats. There may have many other variations of momos, however, the differences might be apparent when looking from the inside. People stuff momos with anything, but the typical fillings would be minced pork and beef, cabbage or cheese mixed with ginger, garlic and other spicy herds.